A dramatic change in the world of fine art took place in the late 20th Century. The acceptance of modern art into mainstream culture irrevocably changed the way we define art. While the origins of modern art went as far back as the 19th Century, it didn’t enter the forefront of cultural consciousness until many decades later. Aided by the post-WWII rise of mass media, movements such as abstraction, expressionism, and pop art were given the support they needed to mutate the world of art. · Does the artist have talent? · Does the artist have something interesting to say? · Does the artwork tell a story or convey a message? · Does the artwork do justice to its subject? · Does the artwork have aesthetic value? · Does the artwork represent a substantial investment of time and energy on the part of the artist? · Does the artwork evoke an emotional or intellectual reaction? With the introduction of post-WWII modern art, these prerequisites (with the possible exception of the last one) went out the window. Suddenly, artists with no discernible skill or creative talent were catapulted into the limelight and revered as great artists. The speed at which this happened suggests that the redefinition of art was not part of a natural evolution, but of a pre-planned strategy, conceived behind the scenes and foisted on an unsuspecting public. In the space of a few short decades, the world of art was turned on its head. Why, you ask, would anyone wish to do this, and what would they gain from it? To tackle these questions, let’s begin by looking at the economic model on which art is based. For many millennia, wealthy families, who were typically called benefactors or patrons, used their power and influence to selectively support artists and projects which furthered their agenda. A simple example would be a wealthy family commissioning a family portrait for the sake of posterity. The patronage model served the art world for several millennia, and it provided a benefit to both patron and artist. It was a culturally neutral model, because wealth was distributed amongst artists in such a way that the competing influences of rich families would usually cancel each other out. No single family had enough wealth to completely overshadow another and cause broad social or cultural changes by virtue of the projects which got the green light. But then something changed in the 20th Century: the concentration of wealth increased to such a degree, that for the first time in history, some families had accumulated enough riches to change the destinies of entire nations. Rather than being content with commissioning portraits of themselves, these wealthy families wanted more. They decided to leverage the world of art to change society itself. The rich and powerful wish to remain that way. By exerting an influence on popular culture, which includes art, they have a means to achieve their end. How then did they achieve their goal? The nobles who lorded over their fiefdoms in medieval Europe knew that the simplest way to stay in power was to keep the serfs weak, disorganized and dependent. The last thing they wanted was for their serfs to develop a capacity for independent, critical thought. That could lead to them questioning their lot in life, which is how revolutions start. Serfdom was eventually abolished, but the same techniques which kept it alive are still being used today. They’re just more carefully disguised. So what does this have to do with modern art? By glorifying the trite and the trivial, modern art retards the development of high aesthetic appreciation and intellectual discourse. It’s another self-preservation tool in the toolbox of the wealthy elite, and it’s used to stop the serfs from getting too smart. 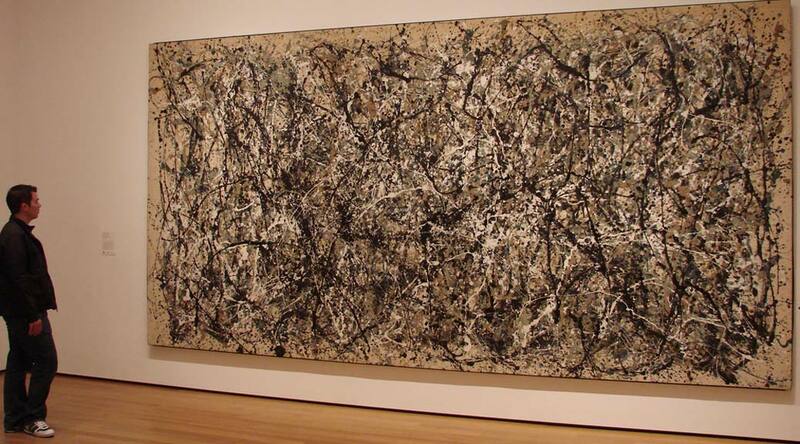 You don’t need a lot of brain cells to process Andy Warhol’s painting of a soup can. Now compare that to Michelangelo’s David. The elite don’t want you thinking too deeply about great works of art and the questions they raise about society, culture, religion, and life. Those are dangerous thoughts, because if enough people think them, they could overturn the whole apple cart. And that is something the elite fear. Given their control of the mass media and academia, it was easy for the elites to push their agenda in the 1950s, 60s and 70s, and tear down the principles that had defined art for many millennia. Newspaper critics were instructed to write glowing reviews of artists who a few hundred years ago would have been committed to an asylum. Art professors were told to sprinkle their lectures with talk of “irony” and “uprooting assumptions” to create a phony mystique around modern art and hide its inherent worthlessness. And gallery curators had to follow the same script or be shunned as outcasts in the artistic community. None of this was important enough in the general scheme of things for the average gallery goer to protest. Most artists (and wannabe artists) didn’t complain either. In fact, they were thrilled, because having no talent was no longer an obstacle to becoming a famous artist. Anyone willing to shock the public with works that were increasingly obscene and disgusting, was guaranteed a spot in the limelight. If all this seems hard to believe, do a quick Internet search using the terms “CIA ugly art” and see what you get. Looking back at the carefully orchestrated madness that took over the world of art in the late 20th Century, we now have the benefit of perspective. At this point, we can call out modern art for what it is: a social engineering tool which was not a natural phase in the evolution of art, but a catastrophic mutation. Dioramas are the antithesis of modern art, because they meet the time honoured criteria of art which I outlined earlier. If you have a good eye and a steady hand, and spent several months designing, building and perfecting your latest diorama, you probably achieved an artistic accomplishment which would put many modern artists to shame. So instead of supporting the cultural brainwashing agenda and attending your local art gallery’s Jackson Pollock exhibit, take my advice and invest in a new set of brushes instead (something Pollock didn’t have a clue how to use).